Linuxslate.com Forum Member simonv has provided more information on this phone. in the Guides & Help Section of this website. Several years ago, I became aware of a Chinese company that was doing some pioneering work on Linux based mobile phones. While many of E28's designs never materialized, they had produced at least 2 models that were sold in Asian markets. In addition to giving E28 credibility, the 2 phones seemed quite compelling for their time, even though they lacked QWERTY keyboards, and big screens. For several years now I have wanted to review one of E28's phones on this website. Emails to E28 went unanswered, and the really cool models they talked about never materialized. I was not able to buy even the base models. I would have had to pay a very high price, fly to China, or buy 10,000 of them. When the iPhone, and latter the Google Android phones hit the market I, for the most part, stopped following E28. Now I have finally been able to buy one of these phones at a reasonable price. What are the E28 phones like? How is the quality of the software? What features do they have? How does the VoIP functionality work? Are there any real advantages to it? 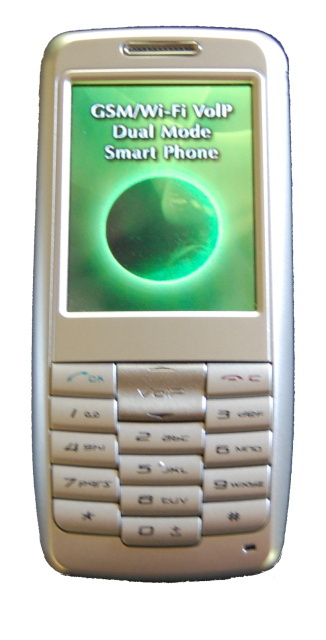 The phone reviewed here is branded as the Skyvoice model S282. It appears physically identical to the E28 Model R2821 (Pictured here from E28's Web site, now apparently discontinued.) We'll see later that it is in fact the E28 phone. It has been brought to my attention that this phone is also sold as the VuTek DP72 (website link at end of article). The specs are shown to the right. The idea behind this phone, and in fact the entire idea of E28's business was the idea of calls automatically handing over from GSM to VoIP/WiFi when a WiFi connection was available, and back again when WiFi was no longer available. This would require a special VoIP service that could route the calls as needed. Skyvoice is primarily a VoIP provider, and does not seem to offer any type of handover from GSM to VoIP. With Google Voice, it is possible to have 1 phone number associated with the phone whether it is connected via WiFi/VoIP or GSM, but in-call handover is not currently possible as far as I know. Either function can be used independently, so the S282 can be used as just a GSM mobile phone, or just a WiFi handset. The E28 R2821 has been approved here in the US by the FCC, but there is no FCC sticker in the Skyvoice branded phone I received. •Bluetooth: 1.2, HSP Profile, OPP Profile. The Model testet here does not have bluetooth enabled. For most people here in the US, buying a phone from China like this represents huge unknowns. It is the intent of this article to dispell some of the unknowns. Let's start with the basics. What exactly do you get? The small size and candybar style makes the phone easy to hold and carry. It certainly is not a quality phone, but it is free from case creaks, gaps or any unfinished appearance. The right side has a small recessed power/unlock key. While this is a rather inelegant solution to the problem of accidental key presses, it does work. Below this key is the stylus storage. The phone sleeps and locks the keys as it should. There are no side volume keys or scroll wheel (Grrrrrr.). Bright Orange (left side) and Blue (right side) LED's indicate GSM and WiFi/VoIP status respectively, as well as missed calls, messages, etc. These bright LED's strobe the entire time the phone is on the respective network, and as far as I can tell, there is no way to turn them off. As well as decreasing battery life, they can be obnoxious in a dark room. If you wear light colored or thin clothes, there may be a light show in your pants. The bottom contains a standard Mini USB connector for data and charging and a 2.5 mm headset jack. More on USB functionality can be found later in this article. It's nice to have these 2 standard connectors. A 3.5 mm jack would be nice, but readily available adapters will allow connection of standard audio cables, headsets and headphones. An adapter cable I made years ago for another phone worked fine with this phone, so that tells us that the 2.5 mm connector has a standard pin-out. The included stereo headset has a mic and the standard answer/hangup button. 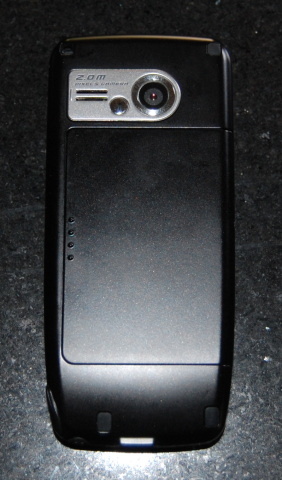 The back contains the 2 mega pixel camera, a tiny self-viewing mirror, and the speaker. There is no camera shutter, and no flash. There is a place for a carry strap or phone charm at the top. The battery door is very thin, and not very structurally sound. I suspect that it will not be long until the door cracks, or simply does not stay in place. Inside the battery cover is the sim card slot, as well as a standard micro SD (Transflash) card slot. The micro SD card is not hot-swappable as both the rear cover, and the battery must be removed to access it. I have only tested a 1 Gig card, but cards up to at least 4 Gig should work fine. I did initially have difficulty getting the S282 to recognize the Micro SD card. After a few tries, it suddenly started seeing the card, and allowed me to format it. Basic sound quality as a GSM phone is fine. Signal reception is on par with other GSM phones. With even 1 bar, calls connect, and generally stay connected. I strongly suggest users buy unlocked phones, and such was the case with the S282 reviewed for this article. It will work on any GSM service in the world. Around here, that means AT&T or T-Mobile. Interesting, AT&T's network here in the US (MCC 310 MNC 410) is not pre-programmed into the S282. This means that on AT&T, the network name will likely be blank for many subscribers. T-Mobile's network name seems to appear properly. The fact that AT&T's name is not shown does not affect the ability to use the phone. 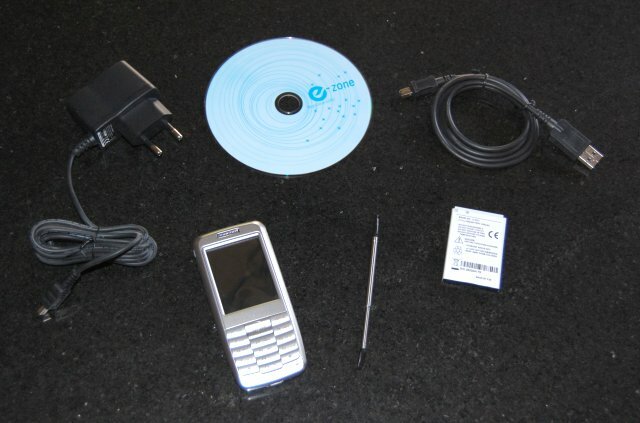 This phone is a Quad Band GSM phone (850/900/1800/1900 MHz). It lacks any 3G capability, although it does have WiFi. In fact with WiFi on board, you may opt for no data plan. If you do have a data plan, you will find that this phone has GPRS only. It does not support EDGE. In today's 3G world, stepping all of the way back to GPRS may seem like a show stopper. Given that the Web capabilities of the phone are pretty basic, and the fact that it does have WiFi, this limitation may not be much of a problem, depending on your planned use. There are more technical details on this phone's Operating System latter in this review, but for here I will say that it is simple and easy to navigate. Setting up GSM/GPRS and WiFi networks is about as simple and straight forward as possible. There are no complicated profiles for GPRS, MMS and WAP settings. Using features such as Contacts, Calendar, Messaging, and most other basic features is user friendly and responsive. Photos and custom ringtones can be added to individual contacts. Custom ring tones in a standard Midi or MP3 format are supported, and you can select different alerts for Calls, Calendar alerts, and Messages. Several "Themes" are included, but there is not much to what they call a "theme". Sadly, E28 has never actually released a high end phone. This phone seems to go out of it's way to prove that. Features such as voice dialing, and cut and paste are missing. The worst problem with the S282 is that there seems to be no provision for setting the clock from the network - either on GSM or WiFi. Worse than that, every time the battery is removed () or runs down completely, the time is lost and must be re-entered. Remember that removing the battery is necessary to access the sim or the SD card. It is amazing to me that a phone apparently marketed primarily to a Chinese audience is missing such basic features. SMS and MMS work as expected. There is support for up to 4 email accounts, but only POP/SMTP email is supported. Go to: Menu --> Tools and Setup --> Internet Setup --> connection setup --> User defined. Same settings need to be entered again for GPRS WAP and GPRS MMS. If you plan on AVOIDING DATA CHARGES by only using the S282's data features only while on WiFi, then simply DO NOT enter the settings for GPRS, GPRS WAP or GPRS MMS, and/or call your mobile provider and ask them to block data. As tested, the Skyvoice S282 supports English and Chinese. The on screen keyboard supports Chinese and Roman characters regardless of the language settings. There is also character recognition, but apparently only for Chinese characters. The S282 integrates a standard SIP VoIP client into the phone. Other protocols Like H.323 are not supported. The settings available for VoIP are limited. There do not seem to be any settings for NAT transversal (Like STUN), but My VoIP provider (and numerous others) do not use STUN. The settings for Skyvoice are set by default, but adding additional ones is easy. Remember that WiFi must be set up prior to VoIP working, and the WiFi network must not block the ports your VoIP provider uses for SIP. VoIP over GRPS is not supported. VoIP over GRPS would not work acceptably and it also violates most wireless provider's terms of service. VoIP calls to Fixed and GSM numbers from the S282 via Callcentric have good quality, and are free of excessive lag. Using keypad touch tones (DTMF) during a call worked first shot. Making VoIP calls with no sim card installed is an impressive demonstration. If you have a VoIP service that will give you a free incoming number (called a DID), completely free incoming calls are possible. A Google Voice account tied to a Gizmo account may be one way to do this. Callcentric has DID's for US$3 per month. SMS messages sent to your Google Voice number will be seen there, and you can send them too. Sure, any phone with a data plan can go to the same Google Voice Mobile page. It's the fact that the S282 has WiFi that makes it totally free. While many high-end phones have WiFi, and VoIP apps for some of those phones are available, the S282 can be had for about the one-third of the price of other unlocked WiFi phones.the S282. Also keep in mind that the S282 is smaller and lighter than even most WiFi equipped PDA's. If you only make an occasional call while not in range of WiFi, you can put a pay as you go sim in the S282. It should also be possible to make emergency only calls with a non-registered sim in the phone. WARNING: VoIP services may not have emergency (911) service. Even if they do, the information that appears on the emergency operators screen may not be where you actually are when you carry your S282 with you. Basic PIM (Personal Information Manager) functionality is included on the S282. This includes Contacts, a basic 4 function Calculator, Memo pad, Calendar, World Clock and Alarm Clock. These last three apps are somewhat useless given that the device will not set itself to the correct time/date. Also included is a English <--> Chinese dictionary. The Memo application deserves additional mention since in addition to text notes (which can be sent as an email, SMS, or MMS), it also supports voice memos, and drawings. The drawing feature is remarkably advanced. It includes adding text, frames stamps, and dialog clouds (like a cartoon) to a picture. Rotation, and limited editing, are some of the other features. It's a bit of a savant in a phone that cannot even tell time. In addition to allowing you to make quick hand written scribbles, it will keep kids occupied for hours. The CD that is provided with the phone includes PC synchronization software, but is for Windows only. Without Bluetooth, other options for getting your contacts, etc. into the phone are limited. I have still found no way under Linux or Mac OSX to sync contacts, etc. The disk also contains English and Chinese user manuals in PDF. There is no PDF reader on the phone, or compatibility with Microsoft Office products, but I would not expect that on a phone this basic. When you format an SD card, it does create a folder called eBooks, but I am not sure what formats it expects or what app will open them. Java book readers and simple document viewers should work on this phone. The Skyvoice S282 is a fairly functional media player. The Music Player plays at MP3, MIDI and WAV. (The voice recorder records and plays mono audio in the AMR format.) The MP3 player is basic, but looks nice and functions well. It calls a temporary selection of files a playlist, but there is no way to save or edit real playlists. A very simple random play (shuffle) is supported. There is no equalizer or bass boost, but audio quality is good, and there is plenty of volume. The top portion of the screen can be set to display the Song, Artist, and Album information, or to one of several graphic effects. The effects move as music plays, but there is no real synchronization to the sound. This phone does not multi-task. Leaving the music player stops the music. Pictures taken with the camera or loaded onto the SD card can be viewed in the Gallery as on most phones. Slide show functionality is included and as mentioned, pictures can be edited in the Drawing part of the memo app, where frames, stamps, and a variety of silly things can be pasted on top. The manual says that the Video player supports 3GPP, and MP4 at QCIF or QVGA resolutions. A MP4 h.264 file of arbitrary resolution that plays fine on an iPod or Google Android phone would not play on the S282, but I have no reason to believe that properly encoded MP4 files would not play. A 3GPP test file played fine. Movies can be played fullscreen landscape. The S282 includes a fixed focus 2 MP camera sensor (1600x1200 Max Image Size). There are settings for brightness as well as features such as Sepia and Black & White shooting. There are several settings for resolution, and digital zoom is available up to the highest resolution. There is a self-shot timer with settings up to 15 seconds. While this is certainly nothing like the camera in the Motorola ZN5 (Reviewed here), the camera is better than one might expect for a basic phone. Sample pictures shot in bright sunlight are shown at the right. 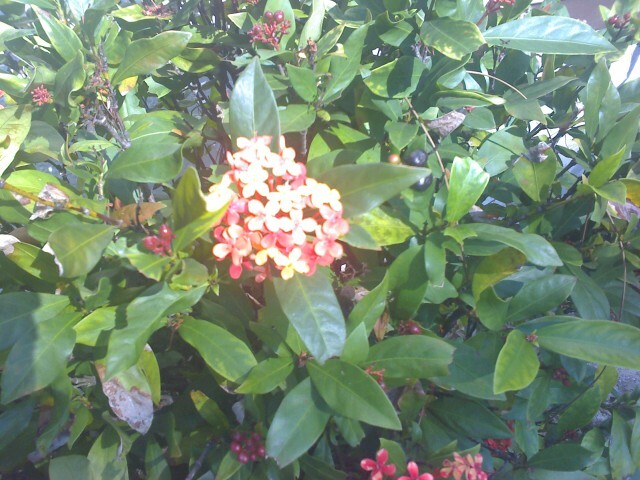 Theses were shot at 640x480 and the full size picture can be seen by clicking the thumbnails. The S282 supports video recording, including audio. Two resolutions are available, HQ ( 176 x144) and MMS (128 x 96). Photos and video can be attached to an MMS or email message. This phone includes a version of the Opera mobile browser. It's very similar to Opera on other similar phones such as the Motorola EZX phones or some Nokia Symbian phones. In the menus, there is a separate item for a WAP browser, but it looks to me like you get the same Opera no matter which you launch. The WAP browser has separate WAP Gateway settings. There is no zoom or full screen function, but there is a wrap function that makes pages fit to the screen width. Pages can be loaded without pictures in case you are on a pay as you go data plan. The browser is limited by a few factors on this phone. First, since there is no 4 way button pad (D-pad), navigation is a little harder than it would otherwise be. Horizontal scrolling must be done with the stylus. Secondly, if WiFi is not available, we are limited to GPRS for our data connection. Third, the phone has limited memory. The end result is that WAP, or mobile specific web pages work fine, but forget about more complicated, or non-mobile websites. Again, we have to be realistic in our expectations here. This is no iPhone or Google Android device, and cannot surf the Web like they do. Compared however to standard Symbian S60 phones or to most Motorola phones (even some current high end devices like the ZN5), this phone is right up there. The WiFi capability pushes this past many phones in it's class. Finding and joining WiFi networks is easy and well implemented. When you first join a WiFi network, you can select which VoIP provider to use. These settings are remembered, and the phone will automatically connect and register on VoIP when a remembered network is available. WiFi status (WiFi Off, WiFi Active, but not connected, WiFi Connected, and WiFi Connected with VoIP Registered) is shown in the status bar at the top of the screen. WiFi range is good and associating to access points (AP's) is fast. The top of the screen has the standard indications for the mobile network signal, and GPRS connection and data activity. The lack of Bluetooth was a big disappointment for me. My research indicates that the phone may have Bluetooth hardware, but there is no Bluetooth capability in the phone as tested here. While Native apps are not available, this phone will run Java applets. 2 games (Chinese language) are included. As mentioned, not having a 4 way pad makes using some java applets awkward, but java apps that use the keypad numbers for navigation should work fine. If a java app is touch screen avare, then it will probably support the touch screen on this phone. Java apps can access the network over GPRS or WiFi. Again, memory is limited, so complex java apps will slow down or simply crash. Unfortunately, one such app is Google Maps for Mobile. It loads but is not stable or usable on this phone. It may be possible to find an older version that works. Websites that distribute java apps can be directly entered into the Java system, or .jad or .jar files can be installed from basically any method of getting them on the phone. It's not the fault of the S282/R2821, it just a fact: WiFi use drains batteries quickly. Even with no calls, but connected to WiFi, or searching for WiFi access points, the S282 will barely last through a 12 hour day. Obviously, also making GSM calls throughout the day, or media use makes this worse. WiFi and GSM can be turned on and off separately. In the S282, "Antenna Off" (We here in the US call it "Airplane Mode") only refers to the GSM radio. WiFi may still be active, and each must be turned off separately. If you know you will not be in range of a WiFi access point for a time, turning off WiFi extends battery life significantly. I did not test GSM only standby time of this phone, because, well, that is kinda not the point. The S282 is charged via USB. Until you specifically select one of the USB functions listed below, the S282 will not do anything except charge when connected to USB. The S282 will not get into loops of continuously disconnecting and reconnecting to devices, and absolutely anything with standard USB power will charge the S282. Charging will continue while any of the 3 modes below are in use. The "Connect PC" Menu offers 2 choices of Modes for the USB port. The first is called "Mobile Device". This mode is intended to be used with the PC Sync software on the Disk. It actually creates a USB Networking connection to the host PC for Contacts, Calendar , etc. sync'ing. More technical details below. The other choice in the "Connect PC" Menu is "USB Mass Storage". As this implies it makes the S282 a standard USB sorage device. Only the Micro SD card is available, and this function does not work if there is no card. Various types of standard files can be dragged and dropped to the card, and then used in the phone. This is one of the features that makes the S282 a capable media device. Memos, Voice recordings, Pictures taken with the camera, and drawings are in standard formats and can simply be dragged off the storage card to any PC regardless of Operating System. Only USB 1.1 is supported, so expect those large media files to take a while to copy over. When I want to load up the S282 with media files, I remove the card and put it in a USB 2.0 card reader. In a menu that is separate from the 2 modes above is a Modem mode. In this mode, the S282 will function as a GPRS modem for a PC or laptop. It works with standard "AT" commands, and setting up tethering is done as it is with other phones that support tethering. Remember, however that only GPRS is available, so data rates will be low. Note: This section is intended for those interested in Linux and some more technical details about these phones. General users/purchasers can skip to the Conclusion. So why is this basic phone featured here on Linuxslate.com? Well, with Linux inside, and a stylus touch screen, this is a Linux slate. How do I know it runs Linux? What Linux does it run? What features/hacks can I do? E28, Triva, and GPL Violations. E28, and by association, this phone, has a bit of a sordid history. This may be part of the reason that we have not (at least not yet) seen great products come from E28. E28 was founded by Roger I. Kung. Mr. Kung worked for Motorola from 1976 to 1994, and worked extensively on the 1st generation Motorola Linux (MING) phones (Such as the E680, A760, and the A780). These Motorola phones run something called EZX Linux, which is a Motorola modified version of MontaVista Linux. The R2821 (and thus the phone as reviewed here) run E28's version of MontaVista Linux. There was a bit of friction early on when Motorola began using their own version of MontaVista instead of sticking with MontaVista as MontaVista intended it. This part has nothing to do with E28, but the fact that Mr. Kung worked for Motorola, and then formed a company that sold phones with very similar hardware and software, was not looked on too favorably by Motorola. Lastly, there have been questions of GPL violations by E28. As of the time of research for this article, there is no mention of the GPL on E28's website, and I could not find any source code. The phone as I received it did not include a copy of the GPL, or any mention of it, or any link to source code. Similarly, the Skyvoice website does not mention the GPL or anything about source code. I would very much like to see E28 succeed. Linux on mobile devices, which has since become extremely successful, probably owes more to Mr. Kung than is widely understood. Never the less, I encourage E28 and Mr. Kung to play by the rules. Other companies that are using Linux on mobile devices, and abide by the GPL, such as Google, HTC, Motorola, and Nokia have been very successful. E28 may find much more success if they too abide by the GPL. The filesystem of this phone is all too easily explored by use of the file:/// protocol on the included Opera browser (See Security, below). It shows a customized version of MontaVista Linux. It's based on a 2.4.20 kernel. In fact one of the reasons for my personal interest in this phone, and why I am writing about it, is to document an example of a consumer device with closer to a "pure" MontaVista embeded Linux. E28's name is all over many of the settings files, showing that SkyVoice has probably done very little to the OS. 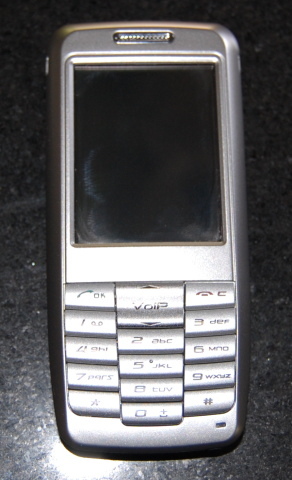 The successor to this phone is the E28 E2831, sold in Europe as the Neuf Twin (Twin referring to the dual VoIP/GSM functionality, just as with the R2821.) There is a French Language website dedicated to providing an open replacement for the Neuf Twin's firmware (See Links, Below). Many of the tools and instructions on the OpenTwin website should be helpful in modding the R2821, or in recovering one that has had it's filesystem corrupted. More information on this as I work with it. Check the Linuxslate.com Forums for the latest developments. I'll post instructions on the Guides & Help page if/when I have more information to post. Security, one of the "Missing Features"
For those wishing to break into the world of Jailbreaking and unlocking the iPhone and other devices, I would suggest that you start with this device. It's likely pretty easy. The ability to browse the filesystem from the browser by using the file:/// syntax is just the beginning. Other than some of the standard entries in /etc/passwd, there is no user such as "mobile", or another non-privileged user. This means that all apps, including the browser are apparently running as root. In short, few of the security features Linux provides are being used. Also settings such as the user's VoIP password are visible in plain text in the settings files. The S282/R2821 is built on the TI OMAP730 SOC (System on Chip). AT command and USB Networking. The S282 supports standard AT commands (With the GSM additional functions) in modem mode. In "Mobile Device" mode, it creates a standard USB network connection. 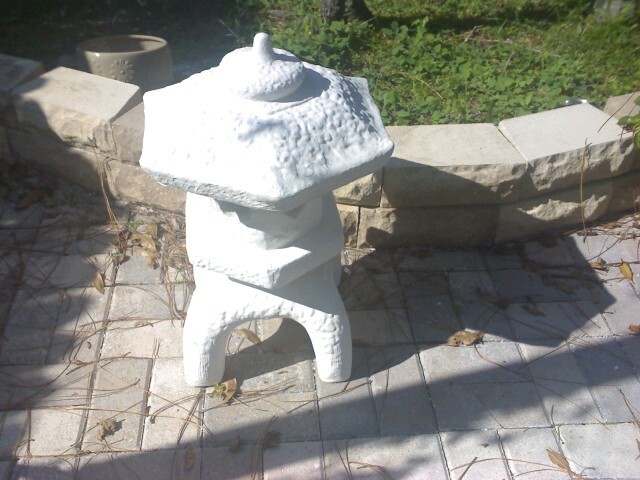 The devices address is 169.254.0.2, and it is listening on port 650 (obex). So the PC sync software apparently uses obex/syncml to exchange contacts, etc. I've had some initial luck browsing the device using obexftp. There do not seem to to be any open ports on the WiFi connection. The S282 is simultaneously one of the worst cellphones I've seen in several years, and one of the coolest WiFi/VoIP handsets. It's one of the smallest Multi-use devices with WiFi out there, and a very usable WiFi/VoIP handset, with far more features than other WiFi/VoIP handsets that cost much more. It's also a small, but functional media player and digital camera. What are the features other than the GSM phone worth to you? If you can get one for that price or less, go for it. Skyvoice Website - VoIP provider, offers the S282 for sale, or with VoIP plans. VuTek Website - The VuTek DP72 is the same phone. and possibly do much worse. I have not tested this firmware. OpenTwin Website - French language - Website and Wiki dedicated to hacking and customizing the Neuf Twin. The Neuf Twin is a branding of the E28 E2831, which is the R2821's successor. Some tools/info found there may be help in modding/restoring the S282/R2821. THIS DOCUMENT IS PROVIDED BY THE AUTHOR "AS IS". IN NO EVENT SHALL THE AUTHOR BE LIABLE FOR ANY DIRECT, INDIRECT, INCIDENTAL, SPECIAL, EXEMPLARY, OR CONSEQUENTIAL DAMAGES ARISING IN ANY WAY OUT OF THE USE OF THIS DOCUMENT, EVEN IF ADVISED OF THE POSSIBILITY OF SUCH DAMAGE. All trademarks/tradenames are the property of the companies that own them.